Of all the random exhibitions and outdoor displays that Times Square routinely comes up with, this just might take the cake. 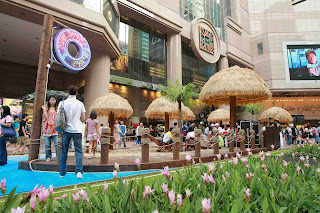 From now until Aug 23, if you head by Causeway Bay, you’ll see an artificial beach complete with deckchairs and straw umbrellas. Patrons are encouraged to take off their flip-flops, enjoy the ‘summer breeze’ (which is more likely to be the air conditioning draft from Lane Crawford) and put on the sun cream. Surrounding the beach is an ocean that comprises of blue flooring to mimic the sea’s undulating waves. On weekends, guest DJs will be spinning music for you to enjoy your time with nature… right next to that long queue of disgruntled travelers anxiously waiting for a taxi.